After Professor Jirair Libaridian began questioning the Armenian approach to the Armenian Genocide and Turkish relations, he formed a friendship with Hrant Dink, now known as the courageous editor of Agos newspaper who was killed at point blank range three years ago because of his beliefs. 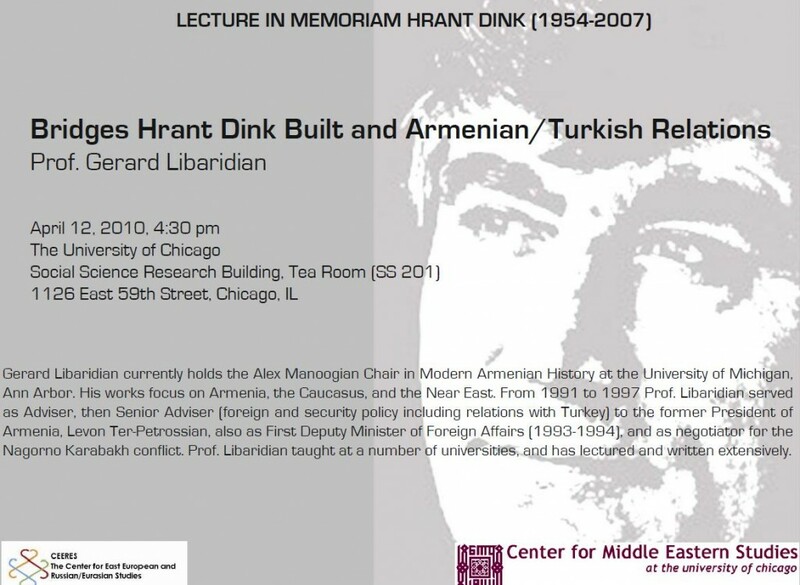 On Monday, April 12, Libaridian, who holds the Alex Manoogian Chair in Modern Armenian History at the University of Michigan will be presenting a lecture titled “Bridges that Hrant Dink Built & Turkish/Armenian Relations” at the University of Chicago. The first lecture in a series that the University of Chicago has established in Dink’s name, it will focus on Dink’s place in Armenian culture, politics and history over the last decade and it’s links to Armenian/Turkish relations. Professor Libaridian, who has served as an Adviser and Senior Adviser for foreign and security policy to former president of Armenian, Levon Ter-Petrossian and also as the First Deputy Minister of Foreign Affairs, took some time out for a conversation about his lecture, Dink and the current state of Armenian and Turkish relations. 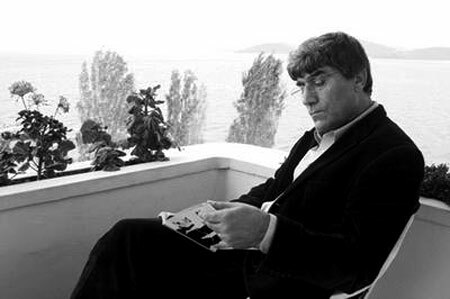 Q: What importance does Hrant Dink in terms of Armenian and Turkish relations? What type of bridges did he build? A: He was a unique character, we don’t have many like him. My main characterization of him is that we in general look at Turkish Armenian relations as black and white, two items that oppose each other – Armenian and Turkey – so it’s all black and white; the two shall never meet and when they meet there are sparks. I characterize him as someone who built bridges, broke down conventional ways of how Armenians look at Turks. He paid a very heavy price for it but he certainly challenged these positions and he was very good at it and by the strength of his personality and his very harmonious way of looking at things he didn’t see a problem of being a citizen of Turkey and being ethnically Armenian. His personality was unique in that he was a very, very good man at heart, you could scream at him, you could argue with him and he would never get upset, by his simple humanity – it would put you to shame, and make you feel bad about yourself, he had that kind of inner strength in his personality. His personality was always troubled because he knew that the peace that he found within himself was not reflected outside. It was like a mission for him to ask people to think and rethink and reconsider and he didn’t just appeal to the heart but had had very well thought out argumentation, leading us to question how we do things and why we do things. Q: How did you meet and develop a relationship with Hrant Dink? A: I heard about him when he started Agos and we were sending some notes to each other. When I first started working as the president adviser, he was one of the early supporters of early government and independence, and was very encouraging of policies we adopted – not making the Genocide the foundation of foreign policy. When I heard about an Armenian paper in Turkish in Istanbul, it was a little odd but then I said we have Armenian papers in English, and Russian and where we live, it is normal and also from a personal point of view, I had started to question our view of Turkey and Turks and the role of genocide in our agenda – I started questioning in the 80s, I thought maybe we should question how we look at ourselves and at Turkey. We’ve had this campaign and we haven’t reached any place, I don’t care whether Washington recognizes it or not, I don’t care if President Obama uses the word genocide – we have become so paralyzed in our thinking. But I care if a Turkish scholar recognizes the genocide.And very quickly that others were starting to think the same way and here was Hrant who was asking us to question how we do things. When I left the government of Armenia – [our friendship] continued and we invited him here for a couple of times, we run the Armenian Turkish scholarship, for a couple of the meetings, I’d say that it was a very well grounded friendship and association and at some point he was here, I invited him to the house, he was with a Turkish journalist also a good friend and we had great time with Turkish colleagues and Armenian colleagues. We kept in touch and I tried to contribute to Agos as much as I could, he as you know, within the community he had a hard time. Once he was killed, people started being nice to him, but before that he was criticized heavily for his speech. Although he never harbored any grudges or hatred, it was still difficult for him, that so many people refused to understand his view point – unfortunately we have people who don’t want to discuss, but want to orate and speechify and they alone know the truth and we can go back and see who they are – he carried that burden. He’s also very important in Turkey of course. “Except for 1908 and briefly after, Armenian in the Ottoman Empire were not treated as citizens; rather, they were seen as members of a religious community. We had a large Armenian community living there. In the Diaspora, we don’t talk about it and we don’t care about it, in the hierarchy of the community, we have placed them at the lowest level, and then next to them are the Armenians of Armenia and then there’s us [the Diaspora] and we’re on top. And so the Turkish-Armenian community was looked down upon and Hrant refused to accept that and told the badriyark – you are the religious sense, but we are not just a religious community, we are also citizens, there are political parties, what happens to Turkey is our business and we will participate as citizens, A democratic Turkey is important for all of us, within which all of us will benefit. His model is relevant not just for Turkey, but also anywhere. As a Diaspora we appear as a single item agenda community. We will vote for the congressman as long as he says its genocide even if he does harm to the county. I heard a story about the senator who took Ted Kennedy’s senate seat [ Republican Scott Brown] was the choice for Armenians because they wanted to punish Obama. To think that you want to punish Obama and destroy the chances of health care, to say that we as Armenians were destroyers of an opportunity for health care reform, it’s ridiculous, I would never identify myself with that. This one issue agenda is destructive on any kind of thinking, this shuns all the other problems and we end up being enslaved by this obsession and we depend on others. Whether Sweden, France passes resolutions – to have a leash on my neck and in the hands of others is not the way I imagine leadership. 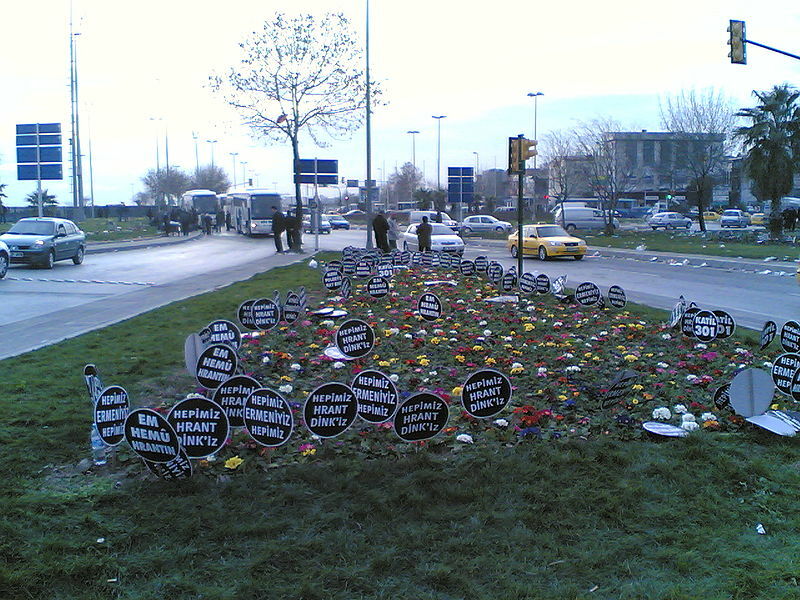 In this respect Hrant was very strong and had an alternative way of looking things. Q:What do you think are the future of Turkish/Armenian relations? A: In the long run it will go in the right direction of normalization but I think both governments are too vulnerable and are going after short term interests instead of long term ones. Long term says we should normalize and open the border – this is important economically, strategically, and politically in every way for both countries, but what happened is two issues were raised – the first being the linkage to Karabakh, which was raised when I was negotiating these issues, and the second issue being, how do you end this international campaign for genocide recognition, and in the end documents indicate that they split the decision – technically did not mention Karabakh, but they created a historical subcommission to address genocide. They got stuck in the secondary issues, is it good for us to open to this border and normalize relations? The answer is certainly yes, that is the big strategic decision and somehow both of them mismanaged this. Q: When the protocols were announced and protests began erupting in Armenian communities, many of the people I spoke to at the large Los Angeles protocol protest said to me that they do not want Armenia to have relations with Turkey no matter what. What do you think about this type of thinking and what would you say to people who think like this? A: I think the Diaspora has changed, I don’t think these people represent all Armenians, there’s quite a bit of concern about the protocols, I’m concerned about the way it was formulated but still I think things can be saved, but I don’t think they don’t represent everyone. 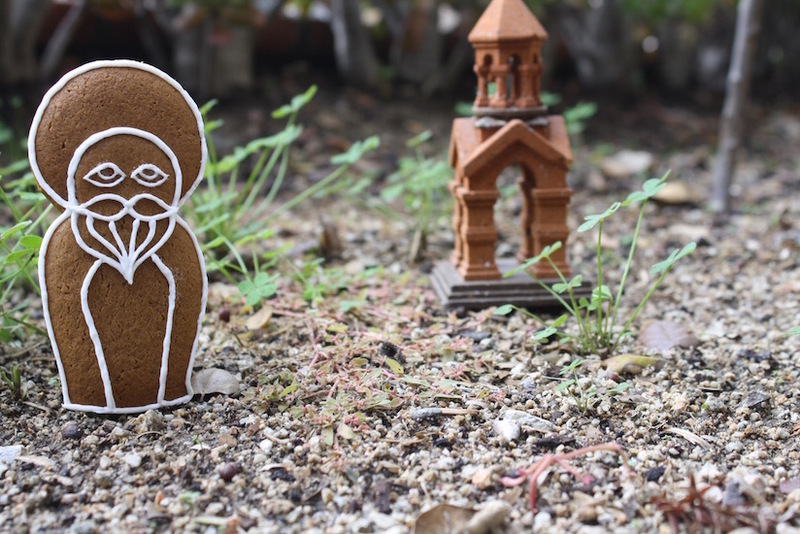 The question is that the noisier community gets more attention and those who agree or are not in that camp, those are people who really are in a different world, that’s what I would say to them. How can Armenia be there and be a normal country and have no relations with two of its four neighbors and two neighbors are much more important than the others – in so many ways – Azerbaijan and Turkey are so much more important than Iran and Georgia. The thing in Armenia’s foreign policy is to create options. We cannot be dependent on Russia and Iran forever on so many things. 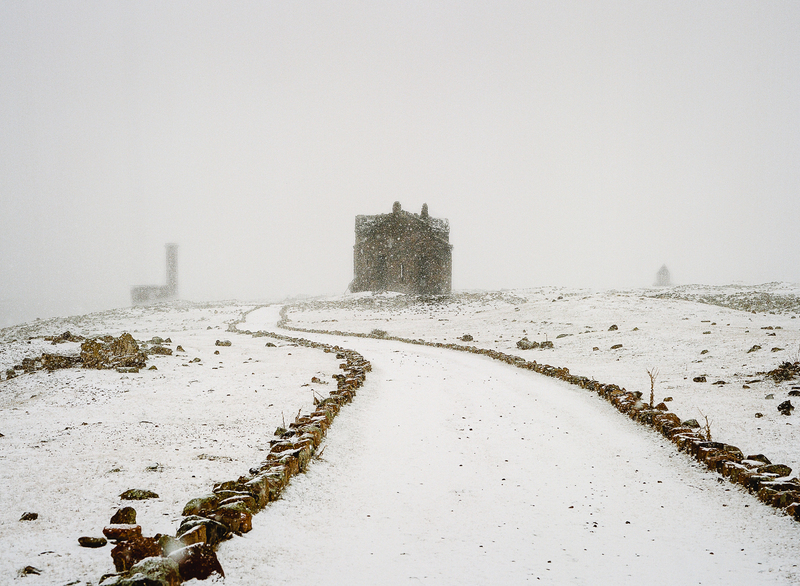 What they’re imagining is Armenia as a theme park, an abstract place where they don’t live. I understand it on a reflexive level, but you cannot afford to govern a county on basis of reflex. I think by and large the people of Armenia would have supported those protocols, I wish they were written a little better, but in terms of normalization, they have no problem. There are those who say that when the Turkey border opens, they will overwhelm us – that means we don’t trust ourselves, or our businesses, which means we don’t deserve to be a country. WHEN: Monday, April 12, 4:30 p.m.